Lucinda (Dull) Hauenstine was born in 1821 in Somerset County, PA, the daughter of George and Christina (Younkin) Dull. She is reputed to have wed Jacob H. Howenstein (also spelled "Hauenstine" or "Hauenstein") (1812- ? ) on Sept. 16, 1841, in Westmoreland County, PA. She was age 20 at the time, and they were nine years apart in age. Jacob is said to have been born "on the ocean" during the long trip his parents made in 1812 as immigrants from Germany to Maryland. The couple produced an extraordinary 14 children, born over a 25-year span between 1842 and 1867 -- Sarah Howenstein, Peter Howenstein, Christina Howenstein, Mary E. Howenstein, Anna M. Hauenstine, Lucinda C. Hauenstine, Jacob W. Hauenstine, George W. Hauenstine, Joseph D. Hauenstine, John M. Hauenstine, Albert E. Hauenstine, Ida F. Hauenstine and Matilda "Tillie" Bellmire. Between 1847 and 1849, the Howensteins migrated to Sugar Creek, Stark County, Ohio, where Jacob earned a living as a cooper. They are enumerated there together in the 1850 federal census. Living in nearby houses were Peter and Barbary Weimer, and John R. and Caroline (Howenstein) Dull. Research by Dr. Frank "Mike" Davis, published in the book Isaiah Vorys (1750-1834) of The Van Voorhees Family, reports that Lucinda died in McClean Township, Licking County, OH in 1874. If true, she would have been 53 years of age at the time. Jacob survived her by a number of years, continuing to work as a cooper even in his mid-70s. 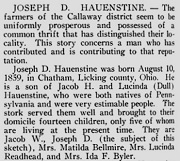 The 1880 federal census shows him heading a household in Saint Louisville, Licking County, with unmarried sons Joseph and John under his roof, and with the family surname misspelled as "Houstine." Jacob also is believed to have owned farmland in Knox County, OH, which his son Joseph continued to own even after relocating to Nebraska. Jacob's fate is unknown. Daughter Sarah A. Hauenstine (or "Howenstein") (1842-1856) was born in 1842 in Somerset County, PA. She is said to have died in 1856 in Licking County and to be buried there in Marple Cemetery, McKean Township. Son Peter Hauenstine (or " Howenstein") (1844-1852?) was born in 1844 in Somerset County, PA. Dr. Davis' research states that Peter died at age eight, in 1852, with burial in Marple Cemetery, McKean Township, Licking County. Evidence suggests that his name was spelled "Haustine" in burial records. Daughter Christina Hauenstine (1847- ? ) was born in 1847 in Somerset County, PA. She wed Civil War veteran Lewis C. Powell (1841/1847-1885), a native of Perry County, OH. They had seven known children -- Clara Powell, Margaret V. "Maggie" Powell, Maud Powell, George W. Powell, Ammon J. Powell, Arthur Powell and Minerva A. Powell. During the war, Lewis served with the 78th Ohio Volunteer Infantry, Company B. Lewis was a farmer after the war, and a member of the Grand Army of the Republic (GAR), a veterans organization. In 1870, when the census count was made, they lived near Newark in Madison Township, Licking County. By 1880, they had moved to McKean Township, Licking County. Lewis suffered from heart disease and died on Feb. 4 or 10, 1885. Burial was in Cedar Hill Cemetery, Licking County. Son George W. Powell made his home in 1900 in Delight, Custer County, NE with his uncle and aunt, Joseph and Lucinda Redhead. More will be added here when learned. Daughter Mary E. Hauenstine (or " Howenstein") (1849- ? ) was born in 1849 in Sugar Creek, Stark County, OH. Daughter Anna M. Hauenstine (or " Howenstein") (1852- ? ) was bon in 1852 in Ohio. Son Jacob W. Hauenstine (1856- ? ) was born in about 1856 in Ohio. He is reputed to have married his first wife Theresa Vorhees in Licking County, although they divorced sometime during the decade of the 1880s. They had two known sons, Harry E. Hauenstine and Jesse Elsworth Hauenstein. His second bride was Catherine E. "Minnie" Clark (1878-1925), who were wed on Nov. 8, 1908. There was a 22-year gap in their ages. Circa 1919, he lived in Toledo, Lucas County, OH and was mentioned in a profile of his brother in law Joseph D. Byler in a Nebraska county history book. Minnie passed away in Erie, Monroe County, MI on Aug. 29, 1925. Son George W. Hauenstine (1858- ? ) was born in 1858 in Ohio, likely in Newton Township, Licking County. Son Joseph Dull Hauenstine (1859-1948) was born on Aug. 10, 1859 in Chatham, Licking County, Ohio. He learned the trade of coopering from his father. 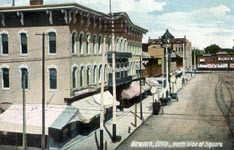 At the age of 20, he resided with his widowed father and younger brother John in Saint Louisville, Licking County, OH. He migrated to Nebraska in 1882, where he first landed in Dawson County. He moved again, to Custer County, NE in 1886. In 1891, when his brother Albert was hanged for the murder of two local men, Joseph took possession of the body and buried it on his homestead, said to have been about four or five miles east of Roten Valley. The following year, at Lexington, NE, Joseph wed Kentucky-born Minerva Ollie Osborn (1876-1955), daughter of David Martin and Mary Ann (Gilbert) Osborn of Indiana, who were members of the Evangelical Church. Their five known children were Florence E. Province, Elsie Mae Sickler, Edith Ida Richardson, Raymond R. Hauenstine and Hazel I. Sickler. The farmers of the Callaway district seem to be uniformly prosperous and possessed of a common thrift that has distinguished their locality. This story concerns a man who has contributed and is contribution to that reputation... During his early life [he] attended the country school and formed studious and industrious habits which have shaped the course of his entire life. His first money was spent on a slate and pencil, and very early in his career he formed a habit -- which developed into a hobby -- of making scrapbooks out of clippings from newspapers. These books he has preserved through the years, and to-day they show not only his wide range of reading but also the course his mind has taken in all public events. In addition to his scrapbook filing, he has kept a faithful diary, and some day these daily accounts will be very interesting reading. His father, although a cooper by occupation, owned a farm, and here young J.O. [sic], as he was familiarly called, put in his first years and began the reading which has made him a well informed man on all subjects... During the drouth period of 1894 he relinquished his homestead to the man who held a mortgage on it, for $350. The farm is now a very valuable one... Mr. and Mrs. Hauenstine established and have maintained a comfortable home and they have reared a family of five children, all of whom are promising candidates for future usefulness.... The hardships and trials of pioneer days are known to Mr. and Mrs. Hauenstine. They have weathered storms and drouths, and they have surmounted difficulties that would have discourages less dauntless spirits. They have conquered their difficulties and are today well and pleasantly located, surrounded by the rewards of their toil. They own the original tree claim and the total area of their Custer county holdings is 375 acres, beside which Mr. Hauenstine still owns the the old homestead of his father in Knox county, Ohio. He and his wife, who has been a true helpmeet, have made their money in farming and stock-raising. They have emphasized dairying and today their dairying operations are made more profitable than ever, by the use of an underground silo which is unique in its construction and very profitable as a forage preserver for milch stock and all grades of young cattle. The Hauenstines are regarded as fine people, and are well esteemed by their neighbors. Mr. Hauenstein exercises a good deal of independence in politics. Son John M. Hauenstine (1862- ? ) was born in 1862 in Ohio. In 1880, unmarried, he lived with his widowed father and earned a living as a day laborer on a farm. Son Albert E. Hauenstine (more popularly "Haunstine") (1864-1891) was born in 1864 in Ohio. In 1880, at the age of 16, he made his home on the farm of his married sister and brother in law, Lucinda and James Redhead, in McKean Township, Licking County. As did some of his siblings, he migrated to Nebraska in the 1880s and settled near Callaway, Custer County. There, he taught in a very small sod school building and was married to a 17-year-old bride. (Her name is not yet known.) Albert has been described as standing "about 5 feet 9 inches high, light moustache, very thin, light hair and light complexion, left eye a little crossed and looks towards the right; eyes light blue or gray; weighs about 140 pounds." His wife was said to be "quite small, very round faced, dark complexion, and will weigh about 90 pounds." He apparently received a tract of land near Callaway through the mechanism of a government patent. In the fall of 1888, it was rumored that Albert had fulfilled the obligations for his patent but at the same time wanted to leave the area, thus placing school board directors William Ashley and Hiram Roten with the obligation. He also allegedly recently had broken into the farm house of a man named Batchelor. At about this same time, Ashley and Roten noticed that a clock and other objects were missing from the school at which Albert taught. They tracked him to his home, following footprints in the snow. There, they confronted him and spied the missing items. In a panic, Albert shot and killed one of the men, and then fired at and killed the second as he was reaching for his gun. He then hauled the bloodied corpses to where he could cover them under a pile of hay, and then he and his wife left town in a spring wagon or buggy drawn by a dark brown horse, carrying a .32 Winchester rifle. The dead men were missing for several days before their bodies were found. "Owing to the fact that it is forty or fifty miles across the country to the county seat," noted the Omaha Daily Herald, "the sheriff will be a week behind the murderer in the pursuit." The State of Nebraska offered $400 reward for his arrest and conviction, and Custer County offered $500 for same. Sheriff Charles Penn published a reward notice. In a trial concluding in September 1889, he was found guilty and sentenced to be hanged. However, the first of several respites were ordered, and the case appealed to the Nebraska Supreme Court, alleging the prisoner was insane. 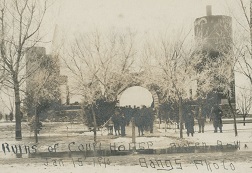 The court upheld the lower court ruling in January 1891, with orders to proceed with the execution. On the scheduled day in April 1891, several hundred spectators assembled at the county courthouse to watch. But word was received from Governor Boyd that the hanging be postponed for 30 days so the accused's sanity could be examined, leaving the crowd disappointed and angry, with Judge Hamer asking the mob to "have patience and respect for the law," said the Omaha Daily Bee. The crowd settled down briefly but then, "armed with crowbars and led by a brother and other relatives of the murdered men, they made a rush into the court house, but were stopped by Sheriff Jones." Albert admitted to the sheriff that "there were times when he was not right but that most of his actions had been feigned. He then requested that Father Haley of the Catholic church be sent for, which was complied with, and the minister has been with him all day. the prisoner told the guards this afternoon that they might as well let the mob have him now, for he thought they would get him anyway." Eventually, Albert was deemed sane, and the appointed day of execution was rescheduled to May 23, 1891. 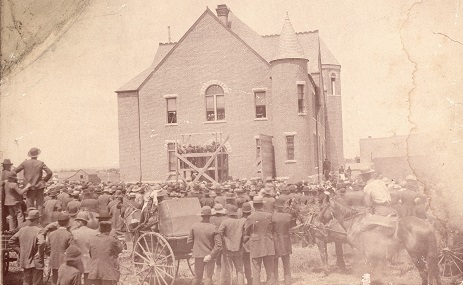 Crowds again assembled at the Custer County Court House in Broken Bow, and tickets were issued for a small number of people to view the hanging from close-up, with the rest further away behind a fence. One of victim Roten's old cousins stepped up onto the scaffold, and then signaled the crowd, which broke down the fence and surged toward the scaffold. The sheriff then quieted the crowd, saying they were in violation of the law, and making every person step back again. Albert was brought up to the scaffold, and made a final statement to the throng, as reported in the McCook Tribune: "Gentlemen, I am very sorry for what I have done, and for the trouble I have made you. I hope you will take warning by what I have done. Remember little things sometimes come to great things. I ask for your forgiveness." At the moment Albert began to plunge to an inevitable death, the rope broke, "too weak to hold the weight of the condemned man and when he fell it snapped, and gasping and groaning he went through the trap to the ground below," reported the Columbus (NE) Journal. The people were there for an execution, however, and this incident, though fearfully trying on nerves, did not deter the sheriff more than momentarily. A new rope was secured as soon as possible, and the sheriffs of other counties, who were present for the purpose of learning something of executions, hastened to conduct the unfortunate man up the scaffold once more, where his pinions were once again adjusted and the new rope placed about his neck. This time better provision had been made and the body was caught up with a sudden jerk which left no room for doubt that the second trial was successful. News reports said that the body was left hanging some minutes after physicians pronounced him dead. The crowd waited even longer, and, said the McCook Tribune, "the expression of grim satisfaction at the vengeance dealt out to the murderer... was general." The sensational news was published far and wide, including on the East Coast, and an 8-inch by 6-inch mounted sepia-toned photograph of the hanging was sold popularly as a novelty. Over the years, the case has been featured in books, newspapers and magazines devoted to Nebraska history, public justice and capital punishment. Among them was Solomon D. Butcher's Pioneer History of Custer County, Nebraska, published in 1901 (page 253). Daughter Ida F. Hauenstine (1867- ? ) was born in 1867 in Ohio. In her teenage years she migrated west to Nebraska from her Ohio home, and apparently settled in Custer County, NE. In 1887, at the age of 20, she was united in marriage with Joseph D. Byler (1857-1918), of the Roten Valley, Custer County, and son of Jacob and Sarah (Yoder) Byler. They had four children -- Bessie Blixt, Clarence H. Byler, Ruth A. Byler and Nellie M. Byler. They acquired 480 acres of well cultivated land and were members of the Evangelical Church. During World War I, son Clarence served with Battery C of the 339th Field Artillery, training at Camp Dodge, IA. This is an ordinary story of an ordinary man, -- one who in his modest way lived his life and in his departure left behind him a splendid family, a creditable record, and the comforts earned by hard toil.... It was in Pennsylvania that the boyhood years ... were spent, and there he had recourse to the common schools, in which he received a good fundamental education that qualified him for the business transactions of life. At the age of fifteen years he left the home farm and started into the world for himself. His first journey landed him in Logan county, Ohio, where he worked for a number of years. From there he went to Garden City, Missouri. There he associated himself with Charles McCants, and the two started for Nebraska. He arrived in Custer county in the spring of 1885. An inventory of his worldly possessions showed him to be better off than a good many others were when reaching the county. he had three mules, harness, wagon and twenty-five dollars. He located in Roten valley, fourteen miles southwest of Callaway, and bought a relinquishment from James Howell. It was here that he established, and maintained for two years, bachelor quarters.... When the Byler home was established in Custer county, in 1887, it was an unpretentious sod house, and the home was maintained and the early developments of the farm started under very adverse circumstances. For two years Mr. Byler hauled water six and seven miles. Then he dug a well 200 feet deep and put in a board casing. He had a horse and bucket to draw the water from the well. Later he added more room to the sod house, but in order to do this he took the roof from the barn and got along with a dirt floor. Research for this page graciously shared by the late Donna (Younkin) Logan, Clark Brocht and Linda Marker. A.E. Hauenstine article from True West Magazine, February 1972. Solomon D. Butcher Collection courtesy of Nebraska State Historical Society. Albert E. Hauenstine execution photo courtesy of the Library of Congress American Memory Project.